MS Dhoni and Suresh Raina played for the same team from the past 8 years. When the captain of the home team, Raina, tossed the coin, his opposite number in Dhoni not only called for it but won it as well. Having elected to bat first, unchanged Supergiants were provided a decent start by Ajinkya Rahane before Pravin Tambe had him plumb in front of the stumps on 21. 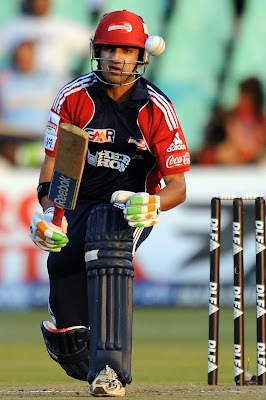 Faf du Plessis was then joined by Kevin Pietersen and the duo added 86 runs off 61 deliveries. When Pietersen was deceived bowled by Dwayne Bravo's slower delivery, Pune still had six overs to go. With the likes of Steve Smith, Dhoni and Mitchell Marsh to come, a total exceeding 180 was much anticipated. But Lions' spinners had other ideas. du Plessis and Smith were sent back to the pavilion in a span of 5 balls. The local boy in Ravindra Jadeja further made sure that Pune score a paltry four runs in his last two overs. In consequence to which, Pune managed only nine runs between overs 17-19. Mitchell Marsh's stumbling efforts fetched him 7 runs off 11 deliveries, further providing a dent to his team's finishing plans. It was MS Dhoni, who eventually scored 20 runs off the last over bowled by Bravo to raise the total to 163, which was still 20 runs short than where they should have been. Gujarat's decision to include Pravin Tambe and Shadab Jakati in place of Pradeep Sangwan and Sarabjeet Ladda made sure that they had three spinners (including Jadeja) who turned the ball away from the all-right-hand Pune batsmen. Raina might have under bowled Praveen Kumar and James Faulkner but must have been delighted to see his bowlers restricting the opposition batsmen to such a total. For a total of 164 to chase or defend in T20s, both the teams have to be on their toes. 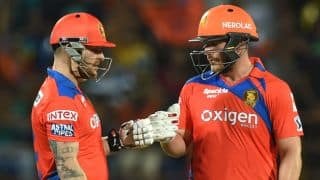 It wasAaron Finch and Brendon McCullum's onslaught, which sized up Lions' chance. The pair added 62 in the powerplay and another 23 runs in the next two overs. In the following over, Murugan Ashwin dismissed Finch but the Australian opener had already scored his second consecutive half-century in IPL 2016. Raina joined McCullum and steadily progressed towards the target. Finch and McCullum provided an apt start. Lions lost McCullum when only 44 runs were required from 41 balls. Had they failed to achieve the target from here, they were to blame no one but themselves. The new batsman in Bravo had come with the mindset of finishing things even before time. Even after losing Raina in the 17th over, he made sure that remaining formalities were completed by the next one. The Lieutenant got the better of his Chief in their first contest. We will be looking for many such contests in the days to come. Gujarat Lions are at the top of the points table now but these are, what you call them, 'early days' in the tournament for both the sides. Gujarat would be looking to carry the momentum forward. On the other hand, Dhoni would be looking to play one out of Ishwar Pandey, Ashok Dinda or Irfan Pathan in place of RP Singh, who is far from his best at the moment.